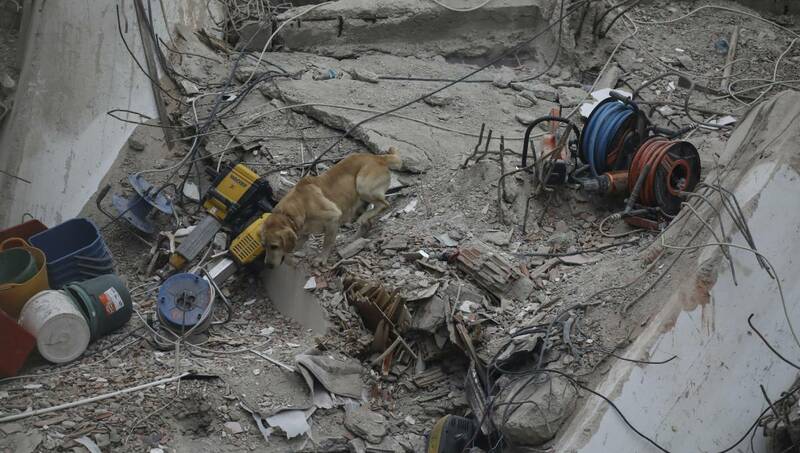 photo: A rescue worker uses Pasha, a sniffer dog, as they search for survivors in the rubble of an eight-story building which collapsed two days earlier in Istanbul, Friday, Feb. 8, 2019. Istanbul, Feb 9 : Turkish emergency services on Friday recovered four more bodies from the rubble of an eight-story building that crashed down in Istanbul, bringing the death toll to 15. One man said he lost nine members of his extended family. “It was an old building, there were some noises … we could sense there was something wrong, but we didn’t think much of it,” he said outside the hospital. The teenager who was rescued Friday, Mert Aydin, was immediately hospitalized, Interior Minister Suleyman Soylu told reporters. Soylu said he had “breaks and fractures” but was doing well. “Our hopes had almost died but today, a million thanks to God. We’re relieved. We’ll be even more relieved if we see her face to face,” said Nuran Nuroglu, Kambur’s cousin. “She is a very good person . everybody loves her, loves everything about her,” said her visibly distraught mother, Nadire Ceri.